Are you ready for hot, summer days? If you’re planning on spending many of them at the pool, don’t forget your swimsuit, towel, shower shoes, hat, sunscreen – and of course, your ABC’s! A is for Asymmetry. If you drew a line through the middle of your mole, each half should be identical, or symmetrical. If the halves do not match up, they’re asymmetrical, which is a sign of malignancy. B is for Border. Moles should have a smooth border, not uneven, blurry, scalloped or jagged. C is for Color. All one color is good. A mix of colors like brown, black and red is a warning sign. D is for Diameter. Any mole larger than an eraser on the end of a pencil should be examined. E is for Evolving. There should be no changes in moles over time. If a mole changes in size, color, texture, or in any other way, this is a symptom of skin cancer. While it’s great to keep an eye out for these signs, it’s even better to protect yourself in the first place. When applying sunscreen, don’t forget the skin on your feet! Avoid being out and about in the middle of the day when harmful rays are most intense. Be aware if any of your medications increase your risk of sensitivity to the sun, too. If you can, cover your feet or keep ‘em in the shade. Of course, there are other causes of skin cancer, so regardless of how much fun in the sun you have, always keep a close watch so you can catch problems early and get the prompt treatment you need. If you spot any symptoms, come see us as soon as you’re able so we can determine the best course of action to keep you and your feet safe and healthy all summer long. 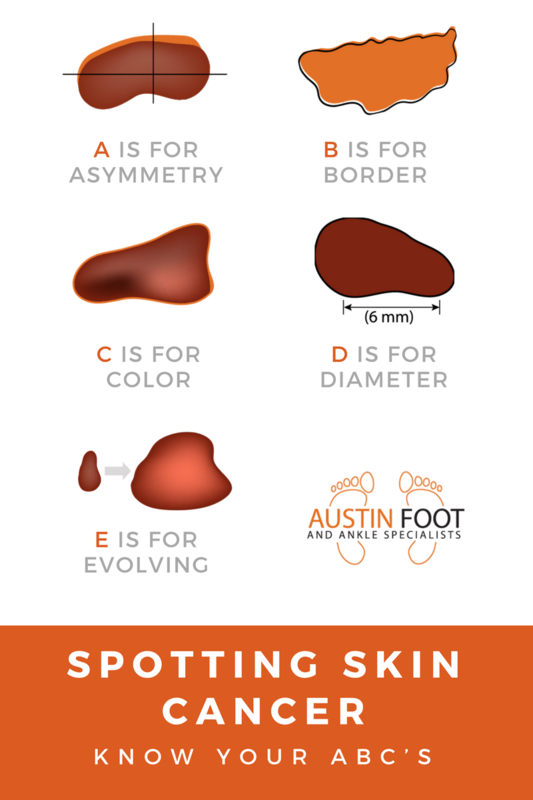 You can reach Austin Foot & Ankle Specialists by calling (512) 328-8900, or by using our online contact form.